Tokyo Smoke in Toronto is a new lifestyle brand that aims to elevate weed. Tokyo Smoke is a lifestyle brand combining Culture, Clothing, Coffee and Cannabis. It is the brainchild of Alan Gertner, a former Google employee, and his father Lorne Gertner, a fashion-industry veteran and chairman of PharmaCan, a company that invests in medical marijuana businesses. Alan and Lorne are betting that the loosening laws governing cannabis—Canada’s prime minister Justin Trudeau wants to legalize weed—will open the doors for more sophisticated branding, marketing, and products. 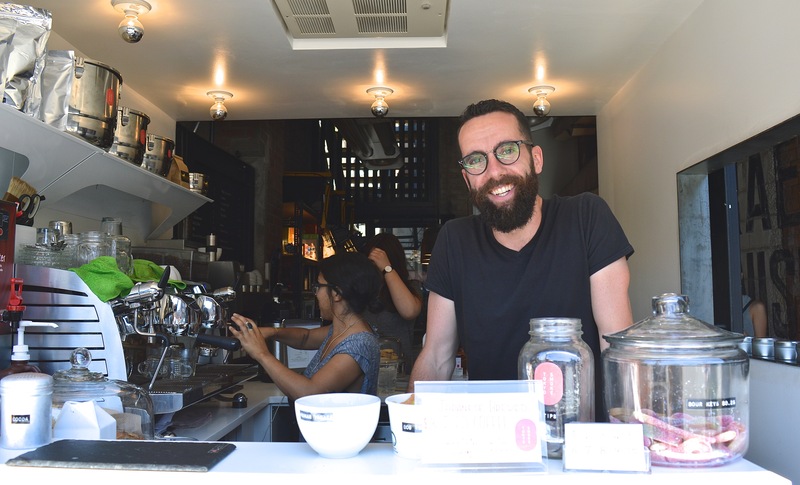 The coffee shop is sandwiched between two warehouses in Toronto’s West End. Built in a former loading dock, the 330-square-foot space—outfitted with custom steel shelving, exposed brick, a rough-hewn common table, and Tolix stools—is the face of a new lifestyle brand that aims to elevate weed. While your average back-alley head shops sell pipes, bongs, and merchandise emblazoned with marijuana leaves, Tokyo Smoke is $300 vaporizers, artisanal ceramic pipes, and oxford shirts. Inside Tokyo Smoke, customers can peruse a number of design magazines and books, spy a few Lego Architecture models, and grab a cup of coffee made from sustainably grown and ethically sourced beans. But Tokyo Smoke’s strategy doesn’t end with packaging or products: it’s about connecting the dots to communicate how its cannabis will make a person feel. Instead of using the names of cannabis strains, which aren’t familiar to everyone, Tokyo Smoke structures its products around four experiences—Go, Relax, Balance, and Relief—and relates them to industries with strong cultures, like coffee and fashion. “There’s a limited nomenclature to understand the experiences around cannabis,” Alan says. “By creating a design-oriented brand, we can build a language.” For example, Go is described as “an energizing, awakening sativa” and compared to drinking an espresso shot. Relax is an indica strain and consuming it is compared to drinking decaf or the feeling of being wrapped in a soft cashmere sweater, which you can also buy from Tokyo Smoke’s in-house clothing line. Tokyo Smoke plans to start selling its cannabis products this year in Washington State, California, and Oregon and open five more stores in Canada and the United States.